Mayor Kevin Faulconer said Tuesday he hopes President Donald Trump’s visit to the region will help him see how a cross-border exchange of goods and ideas and a healthy relationship with Mexico have made San Diego stronger. The two Republicans are not scheduled to meet during Trump’s first visit to California as president, which will be highlighted by a visit to the border wall prototypes in Otay Mesa. Faulconer said he hopes Trump looks beyond the wall to see what a productive relationship with Mexico can bring to the United States. 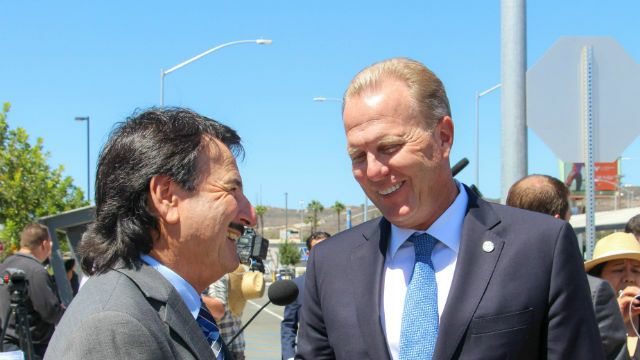 Faulconer has championed the North American Free Trade Agreement at the national level, including at the U.S. Conference of Mayors‘ meeting in January. More than 16 percent of California’s exports go to Mexico, making the country the Golden State’s number one trading partner, according to UC San Diego’s Center for U.S.-Mexican Studies. Much of it passes through San Diego border crossings, which also process a large number of people traveling between the two countries. Some 33 million people crossed at San Ysidro in 2015, making it the busiest border crossing in the western hemisphere, according to federal data.